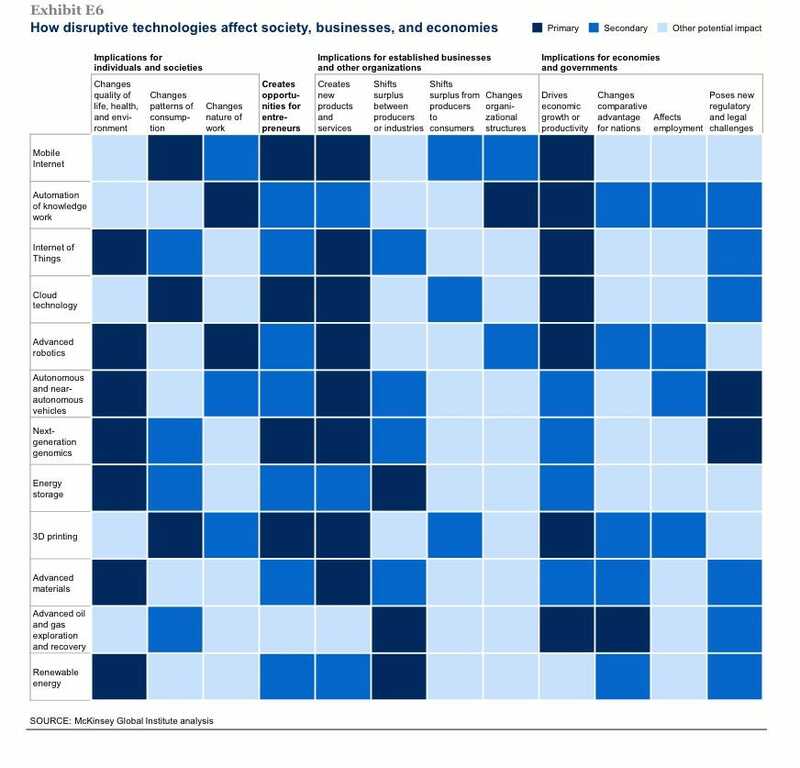 12 Disruptive Technologies That Are Changing The World according to recent study by Mckinsey Global Institute, May 2013. In a recent report McKinsey's Global Institute discusses Disruptive Technologies: Advances that will transform life, business, and the global economy. It came up with a list of 12 technologies that could have a potential economic impact between $14 trillion and $33 trillion a year in 2025. According to the authors, some of this economic potential will end up as consumer surplus; a substantial portion of this economic potential will translate into new revenue that companies will capture and that will contribute to GDP growth. Other effects could include shifts in profit pools between companies and industries." The 12 disruptive technologies include: mobile Internet, automation of knowledge and work, Internet of things, cloud technology, advanced robotics, autonomous and near-autonomous vehicles, next-generation genomics, energy storage, 3D printing, advanced materials, advanced oil and gas exploration and recovery, renewable energy. In many ways the conclusions reached by the McKinsey study show our insatiable taste for gadgets all be them highly innovative, and irresistible, aids at increasing our individual and collective productivity but do they truly address real world issues and the overwhelming treats of rarity or in some cases penury of resources, (minerals and easily accessible energy) , in the face of global warming and harmful pollutions? The operative word is perhaps that such issues are "overwhelming", truly mind boggling. One can readily understand the collective preference for the more abstract disruptions which are highly rated and figure at the top of the list of 12, whereas energy storage so necessary for many renewable energy sources are relegated to the foot of the list. Disruptive Technologies: Advances that will transform life, business, and the global economy. As an Alumi of "THE PLACE OF USEFUL LEARNING", (Strathclyde University, Glasgow, Scotland,UK) I am obliged to shout about my Uni's place at the forefront of Innovation, in Scotland and the UK. I cannot help bragging of my longstanding appreciation of Germany's Fraunhofer Institute for Innovation. that my old outfit have come to the same conclusion a did I. The Technology and Innovation Centre at Strathclyde is a hub for world-leading research, transforming the way academics, business, industry and the public sector collaborate. We are working together to find solutions to challenges that matter in areas of economic importance – including power and energy, health and manufacturing – and helping companies compete globally. Technology and Innovation Centre_Strathclyde University,Glasgow,Scotland,UK.